Meet TNCS’s Newest Chinese Teachers! On August 8th, 2014, The New Century School welcomed two new teachers from China, Cong (a.k.a., “Grace”) Jun and Fan (a.k.a., “Fiona”) Hongtao, courtesy of the Confucius Institute. Our new guests will remain with us for 1 year to fulfill their contract with the Confucius Institute (which hosts teacher-training programs for teaching Chinese as a foreign language) and are rooming together in Fell’s Point in a TNCS apartment used to accommodate out-of-town staff. The teachers have been in Baltimore exactly 2 months now and have settled in nicely, so this is a great chance to get to know them better! In their words, this post “is a great channel for more parents and staff members of TNCS to get to know us.” This is the first visit to the United States for both of them. Cong Laoshi, from Shandong Province, will be teaching and volunteering at TNCS for 1 year. Cong (pronounced “tsong”) Laoshi is from Liaocheng city, in the Shandong Province of China. She has a Bachelor of Arts degree in English from Liaocheng University. Before joining TNCS, she worked as an educator for more than 20 years and has won many awards and accolades for excellent teaching. She is now very interested in primary education, which she believes is the most important period in a person’s life. She has been exploring interesting ways to teach children. Cong Laoshi plans to share Chinese art, culture, and cuisine with TNCS’s community. When asked what she is most enjoying about being here so far, Cong Laoshi replied, “I like the children here, and I like the teachers. I especially like the parents—everyone is so friendly and kind. Everyone cooperates so well together—perhaps our school is famous for this?” You are indeed correct, Cong Laoshi! TNCS is very big on community building :)! This is her first time in the United States, and she is enjoying this trip. She plans to travel when she can and has already visited Washington, D.C. along with Fan Laoshi, in addition to Baltimore. Her favorite food so far is the iconic American hot dog, which she eats as often as she can. The Confucius Institute connected Cong Laoshi to TNCS. After a series of tests at progressively larger levels (i.e., local up through provincial), she came out on top and was selected by the institute to become a teacher/volunteer in the United States. When she interviewed with Xie Laoshi (a.k.a., “Jewel”) via Skype, she says that the type of education TNCS offered appealed to her very much. Moreover, “it was a good chance for me to learn about the real America,” she said. 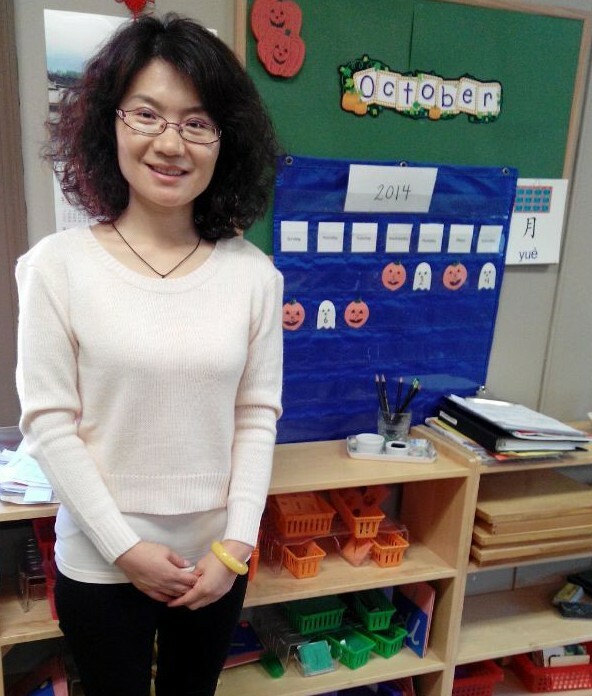 “I will have a chance to communicate with many educators.” She laughed when she explained the irony that she had been teaching English in China for the last 10 years, then flipped and came to the United States to teach Chinese! Fan Laoshi, from Liaoning Province, will be teaching and volunteering at TNCS for 1 year. Fan (pronounced “fun”) Laoshi is from the Liaoning Province of China. She was an English major in college and is now an Associate Professor of English. She says she has always had a dream to come to the United States and that, for many Chinese, coming to America to pursue their dreams signifies their diligence and is a symbol of excellence. For Fan Laoshi, the United States shares similarities with her homeland and also offers differences. “The local people are so friendly; this was my first impression of America,” she said. “I was also pleased to find that the climate here is very similar to what I am accustomed to in the Northeast of China. Baltimore has a clear division of four seasons, just like we do,” she said. Fan Laoshi also connected with TNCS via the Confucius Institute. In order to advance in her career, she says, she needs to work at least 3 months in an English-speaking country, but she also wants to “broaden her horizons personally,” she said. “The teaching environment at TNCS is so different here from that of my local university. I get the opportunity to perceive the local culture, the American way of life, and the American way of education. 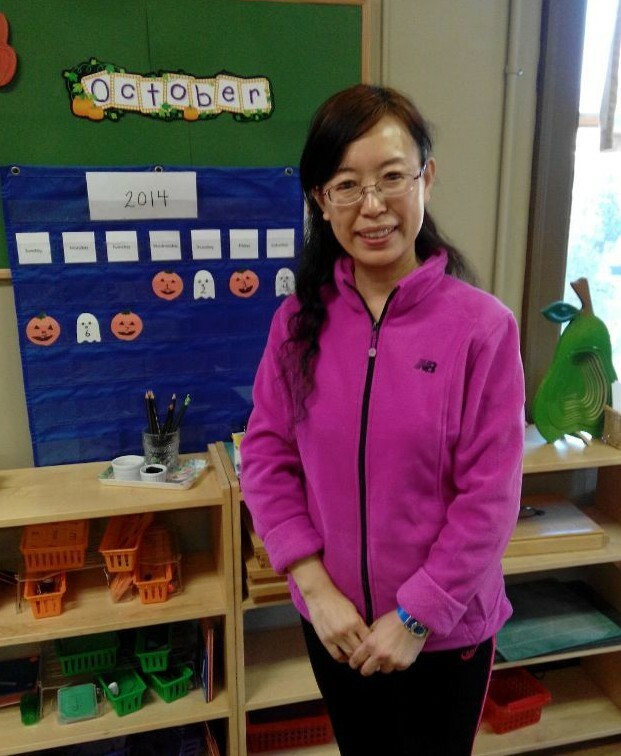 This is the biggest achievement for me.” She particularly wanted to work at TNCS, she says, because she has a 7-year-old daughter in Grade 2 in China and wanted to be in a comparable stage in an American elementary school. The parental point of view on education is also something she is enjoying studying. Fan Laoshi is amused by how independent even the youngest TNCS students are and how they assert themselves. She attributes this can-do attitude largely to the Montessori approach and says she hopes to employ some of it back in China. “We should learn to give our children more freedom, more space,” she said. She feels very lucky to be working at TNCS and respects the educational style. Our two teacher/volunteers alternate mornings and afternoons in Mr. Warren’s and Mrs. Lawson’s classrooms, immersing the primary students in Mandarin Chinese (they speak only Chinese within the classroom). Both find American students to be admirably self-motivated, and especially so at TNCS. “In our country, we help our children a lot, but, here, they are very independent. They know a lot and can do a lot of things by themselves!” said Cong Laoshi. The Confucius Institute at Maryland (CIM) is TNCS’s primary vehicle for interaction with the Confucius Institute overall. CIM’s mission statement is: “Established with support from Hanban, also known as the Office of Chinese Language Council International (CLCI), CIM promotes the understanding of China today through the study of Chinese language, culture, ethics, and philosophy.” At TNCS, we are grateful to have our Chinese ambassadors, Cong Laoshi, Fan Laoshi, and all of our other Chinese instructors both past and present, to acquaint our students with the rich Chinese culture and help teach Mandarin Chinese. Welcome, ladies! We hope you have a wonderful year at TNCS!